Wrexham Glyndŵr University in Wales is one of a number of institutions pioneering the use of UGC from different types of influencers and sharing it across new channels. By doing this they've created streams of content which resonate with prospective students in different ways and used new channels to share the content. In this blog post, we uncover how institutions can extend their UGC initiatives to enhance student recruitment. 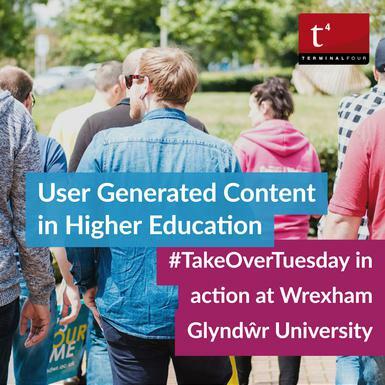 Wrexham Glyndŵr University has been developing it's user generated content activity for over eighteen months. "We began an initiative called WGU Insiders and it’s proving a great source of user generated content as well as engagement on our Instagram account", says Antonia Merola Jones, Head of Digital at Wrexham Glyndŵr University. "Students take over our account. We have four Insiders at any one time, and they post about student and home life in and around the university. They’re from different subject areas, so there is a good cross-section of students involved." Look beyond students for UGC initiatives. WGU Insiders has caught the eye of academics who are finding that UGC can be a highly effective way of raising the profile of their research and teaching, as well as showcasing the day to day life in their faculty for prospective students. "We saw how popular the Insiders were and so we opened this opportunity up to the support and academic staff in the university," explains Antonia. "It’s great to see academics take over our Instagram account every Tuesday on our #Takeovertuesday feature. Our last one was Sara Hilton, the lead lecturer on our football coaching course. She posted lots of great content including details of a Wales international football match which took place at Wrexham Football Club which is located next to the University. It was a really good insight into the course offering since her students were taking part in an analysis of the game with the team's head coach," says Antonia. 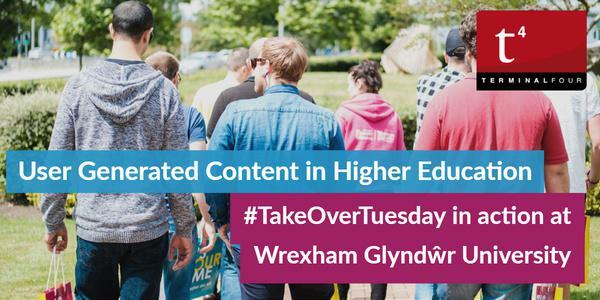 Wrexham Glyndŵr University is also finding new ways to incorporate user-generated content into its university lifestyle, marketing, and recruitment materials. "We often repackage the good UGC content and use it in future marketing email campaigns," says Antonia. "We've also extended the reach of UGC by allocating a section of the online and printed prospectus to it. It's a really different type of content but so effective at delivering messages which resonate and connect with prospective students." What does the future hold for UGC? Wrexham Glyndŵr University is reaping the rewards of UGC. It gives their prospective students different flavours of life on campus. And these snapshots help new students get an understanding of the atmosphere of the university and whether they will fit in. Perhaps the next logical step for UGC at Wrexham Glyndŵr University and other institutions is to increase the level of personalisation. Content could be based on a prospective students' circumstances - their stage in the application journey, the time of year, which touch points have been involved to date, and what courses and extra-curricular interests they hold. If your digital strategy includes plans to grow the institution’s UGC initiatives, or if you’d like to find out more about how personalized UGC could work for your University we'd love to hear from you.